Compartmental models are very successful modeling paradigms in epidemiology. Typically, they are used for quantitative assessments of key parameters such as the basic reproduction number. These models rest on two key assumptions: That a population is well mixed and that transmission is triggered by a population-averaged contact rate. However, experimental evidence shows that contact rates vary substantially, and it has been shown that this variability can change the dynamics of a disease. The most important example being the epidemic of sexual diseases. Their spreading would not be possible without the large variation in the number of sexual partners across the population. Figure 1: Secondary cases are infections caused by an infectious individual. Typical cases in a homogeneous populations (left) and in a heterogeneous population, where the number of secondary cases can vary extremely (right). The SARS epidemic of 2003 highlighted the necessity of a better understanding of social heterogeneities and individual-level based models. So called superspreaders – individuals with a large share of caused infections – were crucial for the spreading of the disease. We are trying to asses the impact of social heterogeneities in spreading and prevalence of infectious diseases using different models for epidemic outbreaks. Since disease transmission is a probabilistic process, we would like to understand the influence of heterogeneity in contact rates on the fluctuations of the process, which can lead an epidemic to extinction or to a larger number of infected individuals. We are also interested in the impact of social heterogeneities in the estimation of the basic reproduction number – the average number of secondary infections caused by one infected individual – since predictions for the outcomes of epidemic outbreaks rely on the estimation of this parameter. 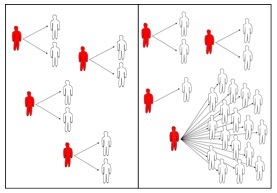 Figure 2: Number of infectious over time in homogeneous (left) vs, heterogeneous populations (right). Among the differences we observe, epidemics become rarer but more explosive, time delays appear which may cause epidemic outbreaks to develop without notice, and the uncertainty of predictions grows as a populations become more heterogeneous. We investigate how variability affects the generation of secondary cases in heterogeneous populations (Fig. 1), and how this may lead to a higher unpredictability in epidemic outbreaks (Fig. 2) caused by superspreaders (Fig. 3). Also, we have studied the behavior of fluctuations on the number of infected caused by the variability of contact rates in heterogeneous populations (Fig. 4). 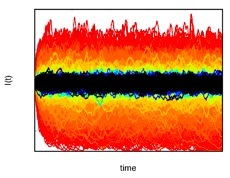 Figure 3: Superspreading events: Vertical red lines show infections caused by superspreaders in a typical simulation (the plot shows number of infectious over time). The presence of these individuals can drastically alter the course of an epidemic outbreak. Figure 4: Fluctuations around the endemic state. In homogeneous populations, certain diseases' prevalence fluctuates around an endemic state (fixed point). Here, we show that as the variability in contact rates diverges in heterogeneous populations, the fluctuations around the endemic state increase. Our results show that under social heterogeneity, the estimation of key parameters, like the basic reproduction number, which is crucial for the estimation of epidemic outbreaks may be biased and lead to wrong assumptions. Woolhouse et al. : Heterogeneities in the transmission of infectious agents: Implications for the design of control […]. Proceedings of the National Academy of Sciences (1997). Liljeros et al. : The web of human sexual contacts. Nature 411, 907 (2001). Lloyd-Smith et al. : Superspreading and the effect of individual variation on disease emergence. Nature 438, 355 (2005).